A table is laid ready for a dinner party, beautifully presented with lustrous silver, fine ceramics and glass - yet this is not a sit down dinner, but instead a feast for the eyes. From serving dishes to cutlery, and sculptural bread baskets to wine coasters, Made For The Table, is an exhibition that celebrates the work of contemporary silversmiths. The collection, acquired by The Goldsmiths’ Company over the last 500 years, reflects its long history of patronage. Visitors are invited into the exhibition dining room to see works from leading contemporary makers including Michael Lloyd, Malcolm Appleby, Jane Short, Angela Cork, Adi Toch, Miriam Hanid and Rebecca De Quin, who draw on traditional techniques to craft extraordinary contemporary tableware. As much as there have been changes in taste and style, domestic silver continues to be a source of inspiration, with the works in Made For The Table demonstrating both a continuity and a break with tradition. At its heart, Made For The Table is a celebration and a showcase for those who continue to make precious handmade objects for the table. Alongside this contemporary silverware, creative practice AVM Curiosities has curated an audio and visual interpretation of the collection. 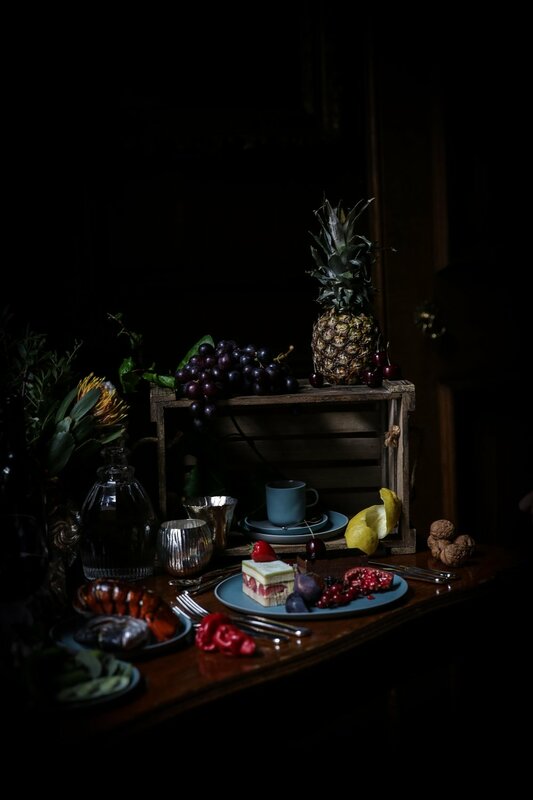 The first is a series of photographs, which take their inspiration from 17th century Dutch paintings: The Silverware Still Lives, photographed by Rosalind Atkinson and styled by Tasha Marks, in the grandeur and opulence of Goldsmiths’ Hall in London, with the bounty of fruit and flora complimenting the modern designs of the works. As part of the exhibition, AVM Curiosities will also present Silverware 7, by New York based composer, Mee, best known for her work with the Smashing Pumpkins, English National Opera and Genesis P-Orridge, who inspired Mee with the cutup technique she has utilised for this commission. Silverware 7 is a contemporary audio piece created using silverware itself as the percussion, alongside studio sounds of master silversmiths Miriam Hanid and Rebecca De Quin as they forged their silverware. The final result is an audio track that both sounds beautiful, and has physicality to it in the making. The MP3 of Silverware 7 is available for visitors to listen to and download above. We recommend playing it alongside your dinner party at home, to add a touch of the audio artisan to the experience.